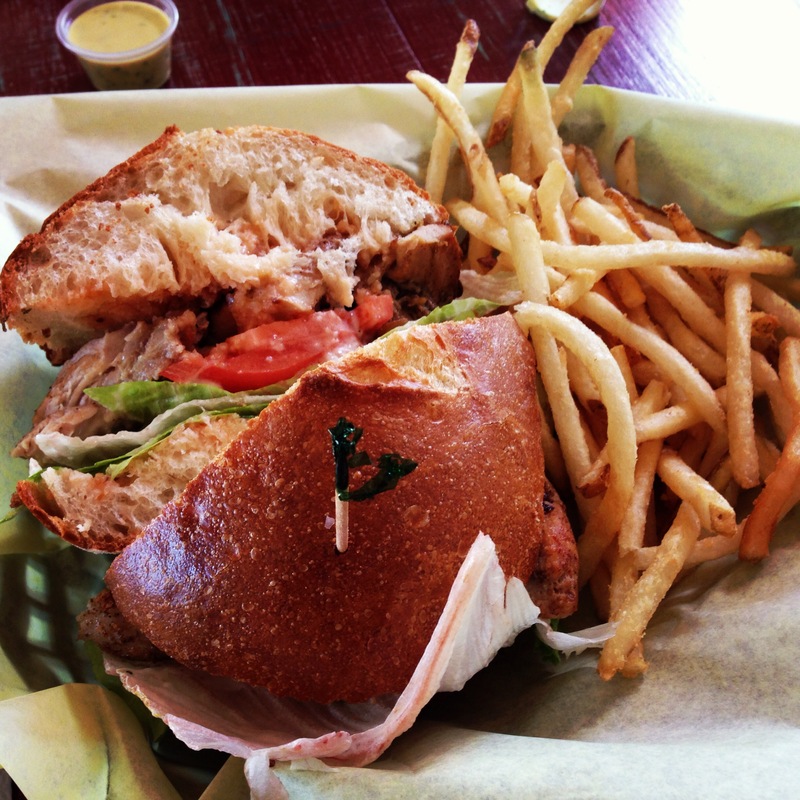 I have tried a few items at Las Primas but this was my first sandwich and fries and boy was it filling and delicious. This one is called pollo a la brasa ($8.75) which is house marinated, slow roasted chicken, spicy pepper sauce, creamy dressing, lettuce and tomato. The fries are crispy and ridiculously good when dipped in their homemade sauce which I can’t remember the name of but it’s the only white one in their self-serve sauce section (possibly the creamy pepper sauce). I take several “to-go” if I can’t eat there. I’ve also tried the alitas ($5) a house marinated slow roasted chicken wings, drizzled with a creamy pepper sauce which is tasty but greasy, a basket of papas fritas (fries, $5), their empanadas ($3.50 each) and their slow roasted chicken plate ($11). Overall very good and the fries and sauce will keep me coming back for more. Their happy hour looks intriguing but I have not had a chance to try their drinks yet. Recap of my mission: Sharing some of the locations with the best fries in town because it’s important to know these things!! A basket of fries is a mere $5 for happy hour and just $6 all other times. 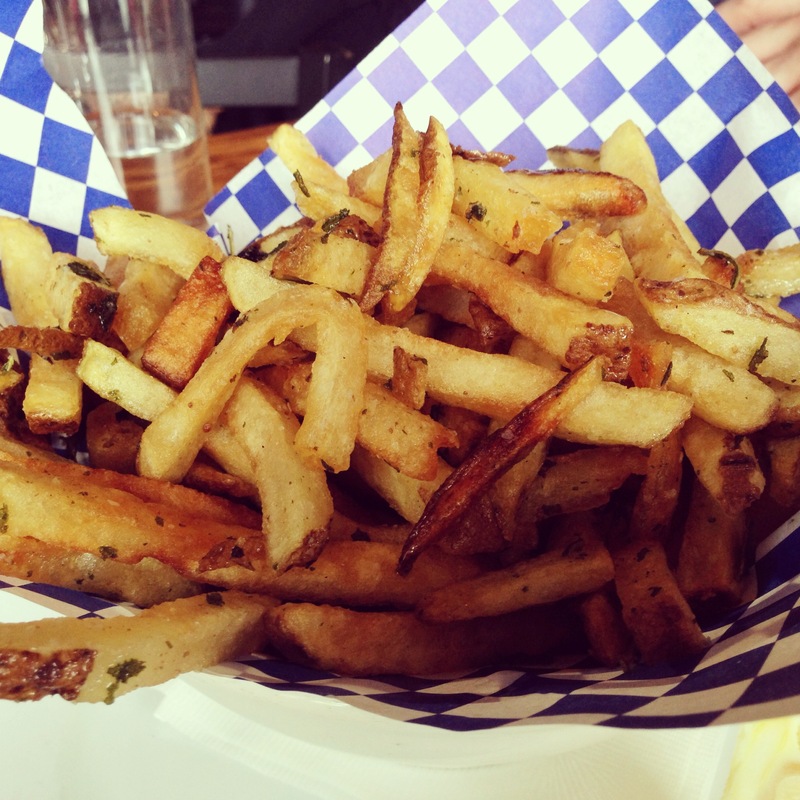 These fries are incredible and I’m sure we have the duck fat to thank for that. Sage and salt are sprinkled on the fries and it comes with aioli dipping sauce and lemon wedges (don’t be afraid of the lemon, it elevates the fries to a new level!). I’ve eaten at branch a couple of times and their food and drinks are solid but holy heck they need to hire more staff to keep up with customers. The bartender can’t make drinks, take your food order and then bring everything out for you and keep up with the tables even with the bare minimum help of another staff or two. Service is slow there and god forbid you want some ketchup or something else because it will take a while to get someone to come around to check on you. The fries will keep me coming back despite the slow service. The fourth installment with my search for great fries in Portland takes me to Cassidy’s Restaurant. (Previous french fry posts featured The Observatory, Swift and Hawthorne Hop House). I’ve only been here a handful of times but each time has been a good experience. It’s conveniently located next to the Crystal Ballroom so eating there before a concert is convenient plus you can see how long the line is getting if you sit by the windows. The place also accommodates large groups fairly quickly even on a busy Friday night when every other place in town can’t seat a party of 8. 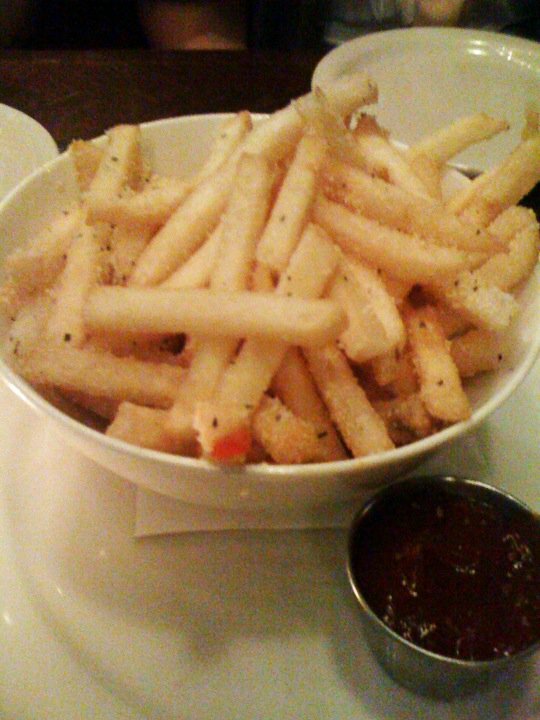 Their delicious hand-cut fries are topped with grated smoked pecorino cheese and sprinkled with rosemary salt ($7). Oh my gosh they are so good. Even if you are not hungry you will eat a few of these if you like french fries. I turned down sharing these fries with a friend until I smelled them and then proceeded to eat half of them anyways. Next stop: The Observatory for garlic rosemary parmesan fries ($2 happy hour). If memory serves me correctly, we ordered 3 of these because we inhaled the first batch in no time and two just wasn’t going to be enough. The smell of the garlic and rosemary on these fries will grab your attention immediately and pull you in to try them and before you know it, they are all gone! 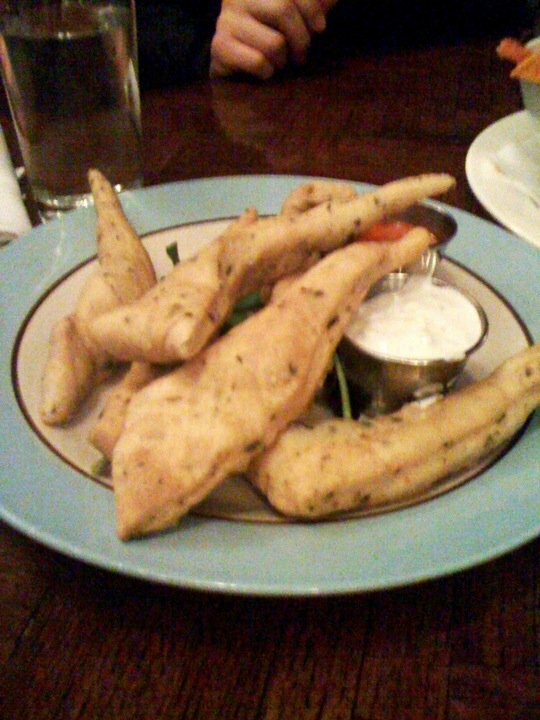 I know this post is about their fries but I thought I would mention they have delicious oregano fry bread ($2 happy hour/$4 dinner) which should be used to slather their smoked whitefish spread on ($5 happy hour/$7-10 dinner) because paired together is absolutely fabulous. Also try to get there during happy hour because the savings are huge which you can use towards tasty cocktails ($1-$5 specials during happy hour). There is more seating in the back (The Over and Out side) which is where I’ve had to sit most of the times I’ve eaten here due to the crowds however, the menu is essentially the same. There is just a more relaxed feel with pinball machines and pool tables gracing the open space. Fried cheese curds and poutine. Don’t eat this alone! The Canadian in me is compelled to revisit the quintessential artery clogging dish we all love and yet regret eating, the mighty poutine. Yes, I’ve already covered it in a previous post but it has to be on my french fry list that I’m slowly compiling. It is pronounced poo-teen and the traditional kind only has 3 ingredients: fries, cheese curds and gravy. The toppings nowadays are a bit ridiculous but I like to keep it classic and only order what I grew up eating because additional toppings like bacon and foie gras might send me straight to food comatose which I only reserve for Thanksgiving and Christmas dinners. Now most Portlanders will say the Potato Champion makes the best poutine but I just can’t stomach the taste of their gravy. I’ve had both the vegetarian and regular one just to make sure and I have to say I don’t really like either. A bit too tangy for my taste and my fellow french fry lovers who ate them with me didn’t like it either. They have great fries but the gravy leaves a bad taste in my mouth. So where does this Canadian go for some killer poutine? The Hawthorne Hophouse is tucked away in a tiny strip mall and they have so far won my heart with their version of poutine. Their fries are hand cut and fried to perfection and the bonus is their gravy is vegetarian and you won’t even complain about it because it is so good. 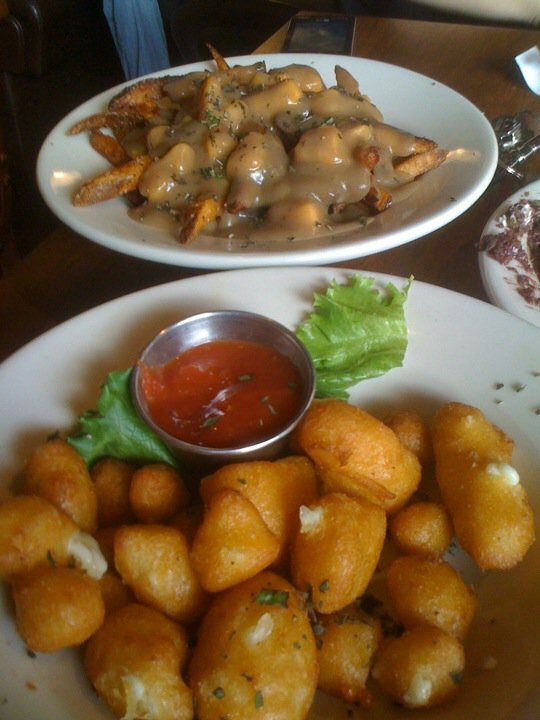 If you want to clog more than just your arteries, try eating it along with a plate of fried cheese curds like I did. Those balls of fried goodness must be portioned out or you will regret it like nothing else. I’m always on the hunt for great poutine so send me a message with your suggestions! My favorite go-to bar food is french fries. Truth be told, it really boils down to any kind of potato in fried form so tater tots can easily be a winner too. When I look over a restaurant’s menu, I take note of what kind of fries they serve and sometimes I’ll choose a place just based on how they make their fries (I’m wacky that way). I look for something different from the run of the mill frozen fries sprinkled with just salt because I can make those at home. The fries that get my attention are anything hand cut, fried in duck fat, topped with cheeses, sauces, herbs or some other interesting condiment that brings it to a different level of potato greatness. This got me thinking that there has to be more people faced with the same question of where to get amazing fried potatoes in Portland. So I thought I would share some of the places to get your hands on the most interesting and tastiest fries in town. I’ve already talked about the tater tot “totcho” (Blitz) and the poutine (Hawthorne Hophouse) so check those out if you haven’t already. 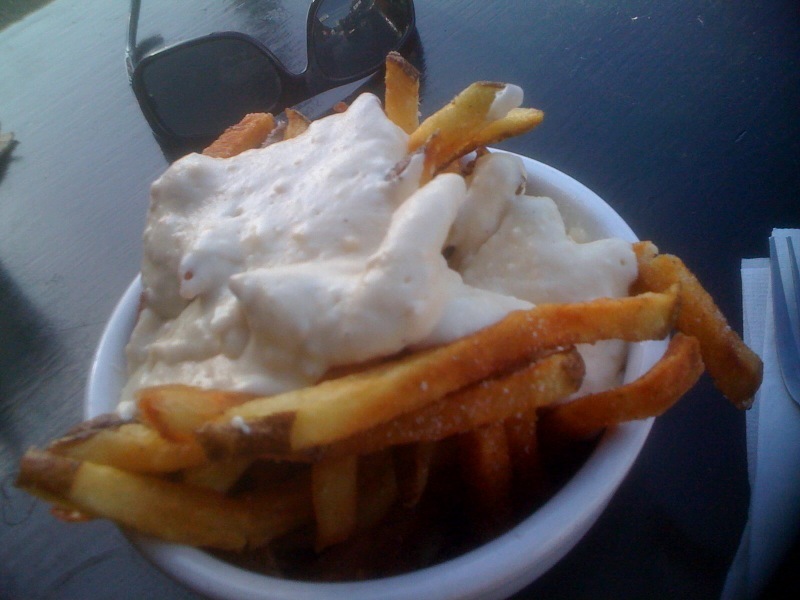 My first french fry post will be about the remarkable fries from Swift Lounge on NE Broadway. I’ve always wanted to go there and the opportunity came when I needed to hit a quick happy hour noshing before a Black Keys concert. Keep in mind there is no wait staff so you have to get in line (which can get super long) and order at the bar. 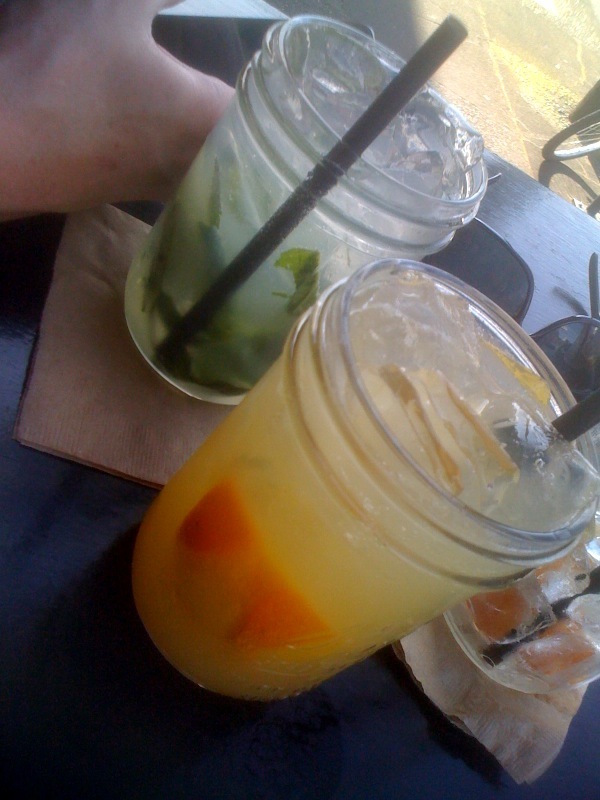 Their $5 mason jar happy hour drinks are fantastic so get one of those too! 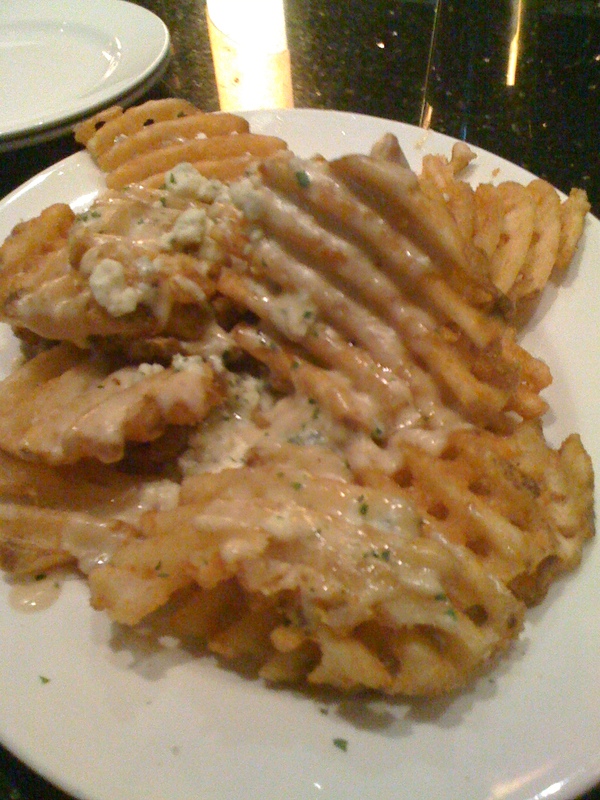 Swift has plain hand cut fries (a happy hour steal at $2) which looks delicious but I like to enjoy over the top ones so I ordered it topped with cheese fondue sauce. I think it looks more like gravy but it is cheese-tastic all the way. I thought I needed help eating these babies and although I’m glad I had the assistance, I could have easily polished these off by myself. You’ll be licking the bowl, it’s that good. Fried potatoes of any kind will forever be on my list of favorite foods followed along side with cheese. If you’ve read my fried cheese curd entry then you will already know that I think cheese is one of the greatest things ever made. Ever ever? Yes, ever ever. So when two of my favorite foods merge together in a dish it is a match made in food freak heaven. 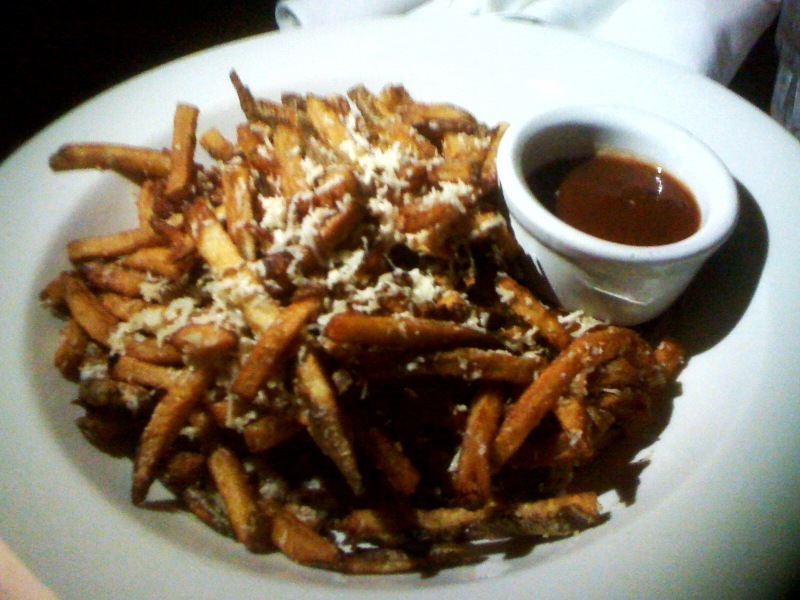 The happy hour fries offered at Henry’s 12th Street Tavern is just that. Waffle cut potatoes that are topped with a gorganzola cheese sauce that is deliciously creamy and somehow there is never enough of. It is salty greasy pub fare that goes well with just about any drink they have to offer. I prefer not to eat in the main dining area and keep to the bar side when I am there. It’s a little noisier but a great space to watch all the beautiful people on a Friday and Saturday night. It is happy hour menu all day Sunday too if you want cheap food that doesn’t come in a paper bag. I got the fries and mac and cheese for $8 and both were shared. The bar staff is friendly and I like the open area despite the challenges with getting a place to sit down late at night.